1. Empty yogurt into small mixing bowl. 2. 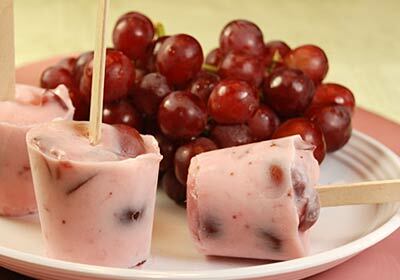 Add grapes to yogurt and mix well. 3. Spoon into 6 small (3 ounce) paper cups and insert a wooden stick into center of each cup. 4. Place on a metal pan and freeze at least 2 hours or until frozen solid. 5. Tear the paper cup and peel the sides off as you eat the pop.